I HAVE A 1970 Triumph TR6C that I'm converting to a ratrod chopper. The frame is a 69 with a plunger rear end, the motor is completely redone, the seat hand tooled, 8 over springer front end, and 2 into 1 exhaust. 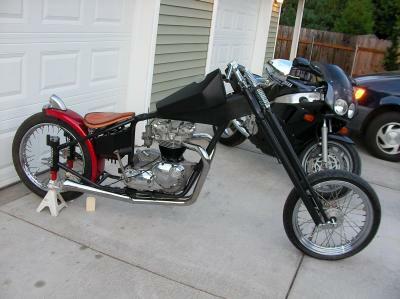 Updated pictures: 1970 Triumph Chopper. your off to good start but you may be causing yourself some future problems with that motor tipped back like that. I've built quit a few trump choppers and when you lean the motor back like that you can create oiling problems real bad one's at that! you may doubt me but I've been there and done that already! on a good note you can make darn nice choppers from triumph's so keep going and hope it's all you hoped for. You are off to a great start. Your bike will be a beauty when completed. It is one of the best old English bikes I've seen. Keep up the good work! GREAT LOOKING BIKE , I WOULD LIKE TO SEE MORE OF THE PROGRESS.